The second online HTML5 game we created for outdoor advertising company JCDecaux was designed to help promote their new network of digital screens around London, to media agencies around the UK. 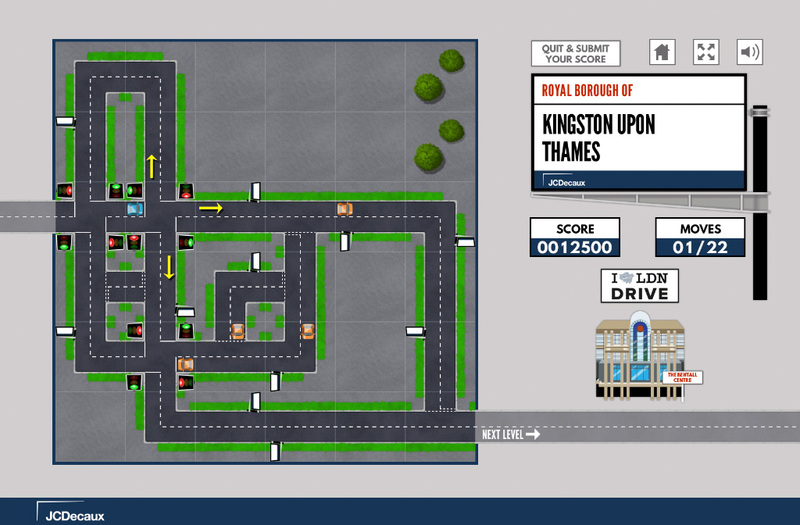 Play through 29 randomly generated London borough levels in this turn based puzzle game. Complete each level within the allowed moves by moving the car around the borough’s road network. Try to pass as many roadside digital billboards as possible to increase your score, whilst trying to avoid red traffic lights and other cars blocking your way. The game also features an educational element aimed at marketers and media buyers, in the form of multiple choice questions relating to audiences in London at the end of each level, for bonus points.